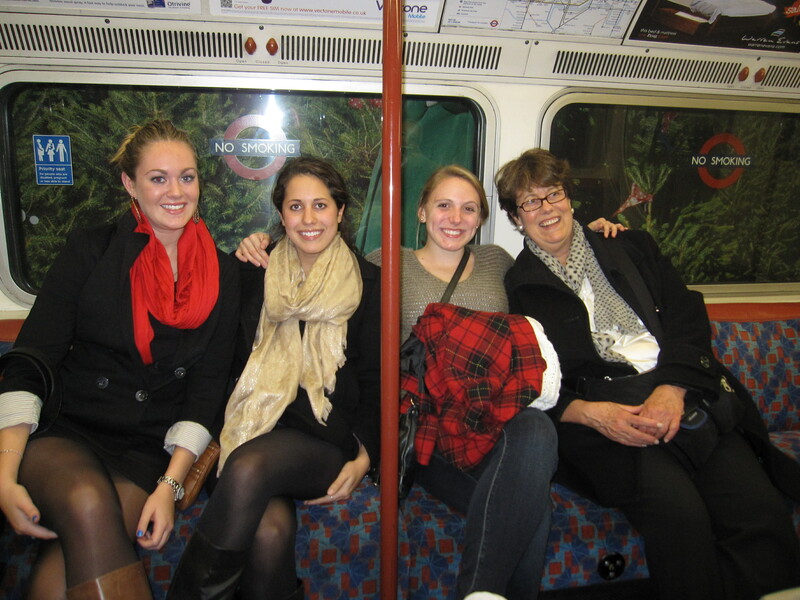 As I am the luckiest girl in the world, my family was just here for a week in London for the Thanksgiving holiday! I picked up my parents from St. Pancreas International train station at 1:30 in the afternoon on Tuesday, as they arrived from a romantic get-away in Paris. We spent an hour hugging and catching up in Costa at the train station, before we made our way to their apartment. Their apartment was only a 15 min walk from my campus, which worked out really well! It was so nice and convenient having them such a short distance away. That night, after we had gone grocery shopping, my parents took Kelly, Julissa, Julissa’s boyfriend Graham who was also visiting for the week, and I out to dinner at Sue Sazzagoni, which was a DELICIOUS italian restaurant right next to Victoria Park. On Wednesday, I (unfortunately) had class until 2 in the afternoon, but after which I basically ran to the apartment because I knew that Matthew had arrived from Newark that morning! That night we went to Hyde Park’s Winter Wonderland, where we walked around the Bavarian themed festival, drank hot chocolate and mulled wine, and rode the ferris wheel. The park was all decorated for Christmas and actually reminded me a lot of Munich, with all the bratwurst and beer stands! 🙂 Winter Wonderland really got me in the Christmas mood! After walking around the park, my family and I went out to a nice restaurant in central London called the Mermaid’d Tail, where I got gluten free fish and chips! After dinner, my family and I met up with Kelly, Julissa, and Graham at The New Globe which is that bar right off of Queen Mary’s campus. 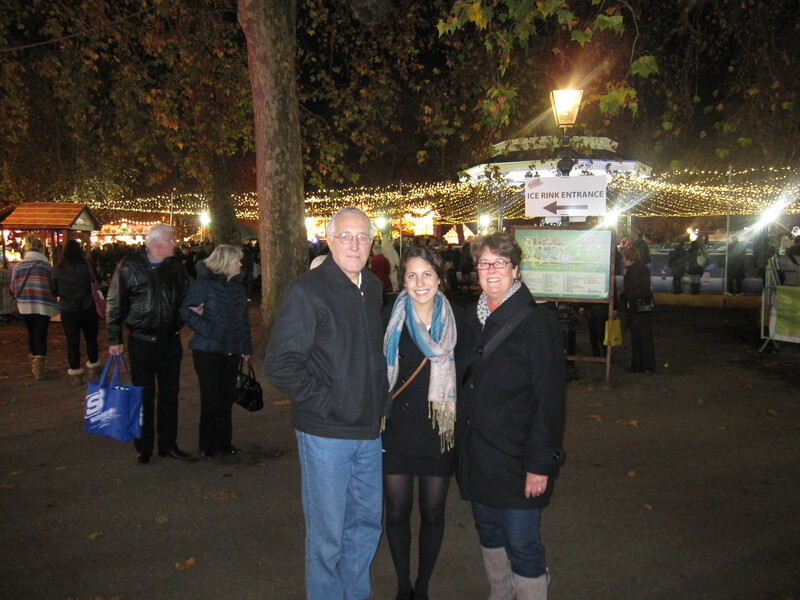 The 'rents and I at Winter Wonderland in Hyde Park! The next day was Thanksgiving! When my family and I came to London earlier, we ate at this amazing gluten free italian restaurant Cotto (which means ‘cooked’ in italian) We became friends with the owner and his sons, and we called them earlier this month and asked if they would cook for us a Thanksgiving dinner. They went above and beyond my expectations! Dinner was absolutely delicious: turkey, sausage wrapped in bacon, gravy, roasted potatoes, carrots, brussel sprouts…Lino and his sons even made stuffing and cranberry relish! 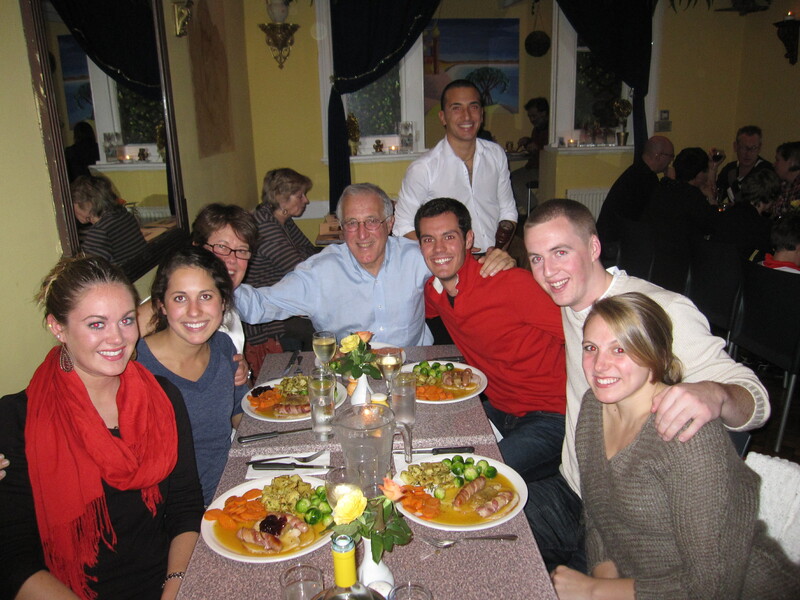 Although I love my family’s holiday traditions, I will not complain about how special it was to have a delicious Thanksgiving dinner, in London, with great company! At the Thanksgiving dinner table! On Friday night, my family went to go see Backbeat, which was a play with music (not a musical!) about the Beatles early career in Hamburg, their fifth member Stu, and their road to fame. It was a great show and at the end the actors put on a mini concert, playing 4 hit Beatles songs. The audience was up and dancing and singing along. The next night, after a day of lazy Saturday shopping with my mom and Matthew, the Piazza’s went to a Premier League footy match! We saw Fulham play Arsenal at Emirates Stadium. Unlike the game we had seen at Craven Cottage, our seats were up high in the stands, which actually gave us a nice change of view as we were able to see the plays unfolding better. Unfortunately, the game ended in a tie 1-1. Unfortunately,the Piazza’s had to leave on Sunday and get back to reality. We had planned to go tour the 2012 Olympic Stadium but because certain train lines were closed, we spent the morning drinking coffee and walking around the Westfield Stratford center (which is the largest mall in Europe) and got a nice lunch there before we headed back to the apartment to clean and grab everyone’s luggage en route to Heathrow Airport. It was sad to see my family leave, it was so nice having them here and gave me the opportunity to take care of them and show off my city! I know these next 3 weeks are going to fly by though as I have my final trip coming up (Amsterdam this weekend!) and my final exams and papers after that! I can’t believe I only have 21 days left? !